For a comprehensive look at all the kits click either City or United. Leeds United have sported some distinctive kits down the years, especially in the days before Don Revie, and here's a pictorial history of the various colours, sponsorships and badges that have been associated with the club and its precursor, Leeds City. 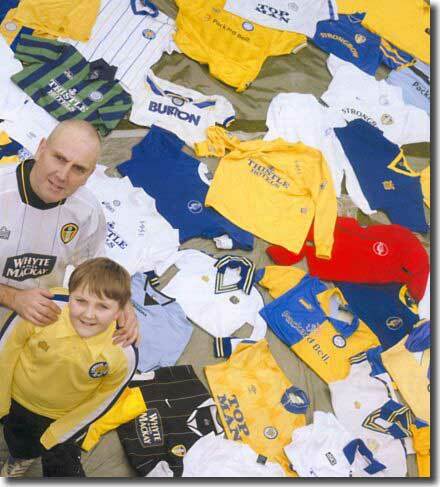 The March 2006 edition of the Leeds Leeds Leeds magazine carried a feature on United fan Paul Waite as he prepared to sell his collection of 52 Leeds tops. The collection included a full set of every shirt - home and away - from 1975 to 2005 and was supplemented with reproduction shirts from earlier years as supplied by The Old Fashioned Football Shirts Company (TOFFS). Paul's the sort of compulsive follower that Leeds United have been notorious for down the years. Paul Waite: "Since around 2000, I've always liked to mess around on eBay. Pretty soon I got to buying one or two a month and it wasn't long before I realised that I nearly had a full set. At that point I wrote to Leeds Leeds Leeds to ask how I could get a yellow lace up collar Thistle Hotels one from 1995/96 as they had never gone on sale. They asked Sean Hardy, the kit man, and the answer was, basically, no chance! But on eBay again I managed to get a Rob Bowman match worn one for £170! "I suppose the best one for me is the one with the blue and yellow hoops - you know the one I mean? Think of Brian Deane! It's classic! I also liked the yellow one we wore in the Nou Camp when we beat Stuttgart in the European Cup play off match in 1992 - the one with the weird blue pattern on the shoulder. The yellow on blue version looked like you'd been sick on it, but blue on yellow looked great!" In an attention-grabbing effort to get a team of journeymen and promising youngsters to aspire to higher things, manager Don Revie famously changed the Leeds look in the early 1960s to a pristine all white, mimicking the strip of the all-conquering Real Madrid team. Prior to that, the playing kits of both Leeds City and United had been in various combinations of blue and gold, as incorporated in the heraldic Leeds city crest, dating from 1893 when Leeds became a city by Royal Charter. Remarkably, the white has stuck ever since Revie's original gamble. From 1976 onwards, the all white has generally been punctuated by trim and edgings of blue and gold; the away kit has used the same colours in varying combinations, though for a time red was used sporadically. That never gained favour with the Elland Road public, for whom the colour was always inextricably linked with the much-despised Manchester United. There were even complaints in the late 90s because the Packard Bell sponsor's logo was primarily red! It was partly to do with the blue and gold, but mainly because of the association with the nearby Old Peacock Inn, that Leeds City came by their original nickname of the Peacocks, a moniker that was passed down like a beloved inheritance to Leeds United and stuck with the club long after the white became de rigueur. Though the Football Association was formed in 1863 and introduced the first rules of the game shortly afterwards, it was some time later before strictly uniform kits and colours arrived; teams were often clad in a hotchpotch of whatever gear was lying around. The young men involved in 'Socker' at the time were preoccupied more with their individual look and style than appearing as part of a single, coherent entirety. Hunter Davies from Boots, Balls and Haircuts: "Looking at the photos of the amateur teams in the early years, you see a certain swagger and swank as they stand in their pristine jerseys and knickerbockers, trying hard to be individuals, striking personal poses, some lounging at the front, others sitting sideways. The captain was usually very easy to spot, looking captain-like, aloof from the team. "With the coming of the professionals, a uniform, regimental team photograph soon took over. There was a period when some teams lined up in the goalmouth for their team shot, in a straight line, but this didn't last long, and from about 1905 onwards the standard team photo was established, with two rows of players with the captain in the middle of the front row, holding the ball. It continues to this day. You see players automatically grouping themselves, without being asked, having seen photographs of football teams in the same formation. "In that same programme there is a witty reference to the latest styles on the pitch, with players starting to wear shorter shorts. In describing one player showing a lot of naked flesh, they said 'it was about a shilling cab fare from the top of his stockings to the nearest portion of his nether garments'." Recognisable team strips started to emerge after the introduction of the FA Cup in 1871. Dave Moor from Historicalkits.co.uk: "Colours were often those of the public schools and sports clubs with which the game was associated: Blackburn Rovers first wore the green and white of Charterhouse School, while Reading first played in the salmon pink, pale blue and claret colours of the rowing club that spawned them. 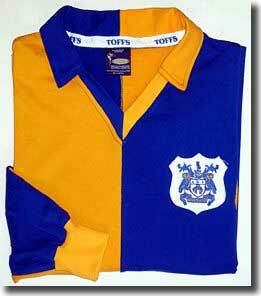 Colours were changed frequently, depending on what local suppliers could provide and the players could afford. The game was played almost exclusively by middle class men who could afford to buy a shirt in their club's colours. That said, plain white shirts were the most popular kit of the period, being both relatively cheap and easily obtainable. "During the 1880s the balance of power shifted decisively from the middle class clubs of the South towards the industrial heartlands of the Midlands and North West. Rows over broken time payments led in 1885 to a decision by the FA to recognise professionalism and the Football League was formed in 1888 to provide the leading clubs with regular fixtures against the best sides. "After 1885, the expense of buying playing kits for those who turned professional fell on the club rather than the players. Secretary managers with an eye for the accounts naturally preferred to spend as little as possible, leading to a trend towards simpler kits in basic colours. "Stockings did not form part of the kit until the turn of the century while players wore heavy shin guards outside their socks. "By the close of the century most of the leading clubs were wearing strips that would be recognisable today. "By 1901, the regulations that required footballers to cover their knees were relaxed and shorts (known as 'knickerbockers' or 'knickers') became shorter. Shirts and shorts were close fitting and made from tough, heavyweight, natural fibres. For the first time, stockings became part of clubs' strips. These were initially self-coloured but quickly design features such as contrasting rings on the turnover began to appear. The main stocking colour was always dark (red, blue, black or dark blue); pale colours did not appear for another 50 years. "Knickers were only available in white, black or navy blue. It was exceedingly rare for clubs to wear matching shirts and shorts although Swansea Town (now Swansea City) have always worn all-white. "Shirts with laced crew necks became popular but a variety of collar designs were evident. Striped shirts were popular and the trend was for stripes to become wider than they had been during the previous century. Striped jerseys tend to make the wearer seem taller while hoops emphasise the wearer's bulk. This seems to be the reason why Rugby teams favour hoops while soccer clubs prefer vertical stripes." It is reported that, when Royal Arsenal became the first southern club to be elected to the Football League in 1893, "their shorts cost 3s 3d, their flannelette shirts 2s 5d and their russet calf boots 8s 6d". Leeds City Association Football Club was formed in 1904 and entered the Second Division of the Football League a year later sporting a kit consisting of dark blue shirts with old gold trim, white shorts and blue socks. The shirts also bore the club's badge, the city's crest with its distinctive three owls. Following the appointment of Frank Scott-Walford as manager in 1908, the City shirt was redesigned to incorporate a rather ostentatious, old gold pinstripe. A year later there was a reworking of the theme with the stripes in the top being swapped, making for a rather gaudier look. That City kit was one of the more distinctive around at the time, but was abandoned after a short period, probably on the grounds that it was simply too fussy. In the summer of 1910, City signed five young and inexperienced Irish players and, as the Leeds Mercury reported, on 5 September 1910, "It must be remembered that these Irishmen are very young men, who have been brought into a higher class of football than that to which they have been accustomed, and that they were playing their first match amid unfamiliar surroundings. Mr Scott-Walford evidently had an eye to making his new men feel at home as well as to stage effect when he attired the team in green jerseys and supplied green flags to mark the centre line." They played in that kit throughout 1910/11. After City were forced to apply for re-election to the Football League in 1912, Scott-Walford was replaced as manager by Herbert Chapman. The soon to be celebrated Chapman brought fresh hope to Elland Road with a vow that he would bring top flight football to Leeds. He came very close to doing so in the years before World War One, when Leeds City introduced another new look. Their new shirts were still principally dark blue, but were now hooped by a distinctive, wide gold band. The hoop was replaced shortly afterwards with a broad gold V on the chest, a design that remained in situ until City's untimely demise. During World War I, Leeds City enjoyed noteworthy success in unofficial competitions, but their financial dealings were the subject of later inquiry by the football authorities. The Leeds City club was wound up in ignominy in October 1919 with all their players disposed of via auction. Burslem Port Vale eagerly assumed Leeds' place in Division Two, but there was soon another professional outfit formed in the city: Leeds United Association Football Club was admitted to the Football League in 1920. A driving force behind the early development of the new club and their election to the League was Huddersfield Town chairman Hilton Crowther, who sought at first to merge the two clubs. He eventually left the Terriers behind to take over at Leeds United, bringing manager Arthur Fairclough with him. Their history together at Leeds Road was echoed in the first fifteen years at United as the club kit was modelled on Huddersfield's blue and white striped shirts, in combination with white shorts and dark blue socks with blue and white rings on the turnovers. The Terriers dominated English football in the Twenties under the management of Herbert Chapman, winning their first League championship in 1924, the same year United won the Second Division title. With the resumption of Football League activity in 1919 came a rapid expansion in membership numbers. Both the First and Second Divisions were extended from 20 to 22 clubs. The following year, the First Division of the Southern League was annexed into the League as an embryonic Division Three. Another twelve months brought the introduction of a Northern Section of the Third Division, populated with major non-League outfits from the North. With the rapidly escalating number of professional clubs, the Twenties saw a massive diversity in colours and combinations, though there was little in the way of design innovation. In 1934, United ditched their blue and white stripes in favour of blue and gold halved shirts incorporating the city crest badge; the shorts were white and socks blue with gold tops. The kit was worn for the first time on 22 September as United lost 3-0 at Elland Road to Liverpool. In 1939, the Football League Management Committee made the numbering of players' shirts mandatory. The introduction of numbers was largely down to the visionary Herbert Chapman. He argued that they would make it easier for players to know where they were on the field in relation to their team mates. The use of shirt numbers dates back to August 25 1928 when Arsenal wore them in a 3-2 defeat at Sheffield Wednesday. The system deployed by Chapman for the game was slightly different from the one that was to be accepted years later, with the home team taking numbers 1-11 and the away team wearing 12-22. The concept of numbered shirts had first been mooted back in 1906, but had been rejected by the game's lawmakers, who continued to resist it. The Football League were not impressed by the experiment, ordering Chapman to drop his plans. He reluctantly followed their directive, but continued to use numbered shirts for the reserves. Arsenal wore numbers at Highbury in December 1933 during a friendly match with FC Vienna. The Football League Management Committee rejected numbered shirts again at its 1934 general meeting, but on June 5 1939 the Committee finally bowed to the inevitable. They agreed a system with both teams wearing numbers 1-11, each representing a particular position in the classic WM formation. Numbering was mandated for the 1939/40 season, but only three games later Britain went to war and the League programme was suspended. It was another six years before numbered shirts finally became a permanent feature of League football. Dave Moor: "Stripes began to appear on the side of shorts for the first time towards the end of the decade. Shirts and shorts became more generously cut, giving rise to the baggy shorts reaching to the knee so fondly remembered on shorter players … Clothing rationing limited the ability of clubs to replace their kits and several were forced to change from their traditional colours to those that they could purchase with ration coupons. Southport FC turned out for several seasons in green and white hoops, a gift from one of the club's directors made during the war. Laced crew necks all but disappeared aside from a few diehard, traditionalist clubs, in favour of collared shirts. Hooped stockings became extremely popular. During the early Fifties most clubs stuck to their traditional designs with only minor alterations to shirt and stocking trims." The eccentric Major Frank Buckley became Leeds United manager in the spring of 1948 with the club back in the Second Division. He was convinced that the players were performing poorly because the halved shirts made it difficult for them to pick each other out. Former player Jim Bullions recalled that the Major organised a practice match in October 1948 with one side in club colours and the other sporting plain shirts. Chairman Sam Bolton and director Percy Woodward watched from the sidelines and were persuaded by Buckley to invest in a new strip. United switched to old gold shirts finished with blue sleeves and collars, white shorts and black, blue and gold hooped stockings. Black shorts replaced the white ones in August 1950 on the grounds of improved visibility. At the start of 1955/56 came another change, to royal blue shirts with gold collars, white shorts and blue and gold hooped stockings, a kit that echoed that worn originally by Leeds City. The change was lucky and Leeds won promotion at the end of the season. They were still wearing the same kit when they were relegated four years later under the management of Jack Taylor. Dave Moor: "Continental influences were seen in new lightweight strips that began to appear in 1955, featuring bold V-necks, short sleeves and more streamlined shorts. There were several innovations in design, perhaps most notably the 'candy stripes' first worn as change strips by Manchester City and Aston Villa in successive FA Cup finals (1956 and 1957 respectively). This design enjoyed a vogue that lasted until the mid Sixties. By the end of the Fifties the heavy playing kits and boots of previous eras had disappeared. "Beginning around 1960, crew necks started to replace V-necks. Shirts became ever tighter, shorts became very short indeed and stockings were lightweight. "It might be supposed that technical advances in textile manufacture and dye technology would have resulted in greater innovation in kit design. The reverse was true: because of the increased use of floodlights, which allowed midweek games to be played at night, many clubs adopted simplified designs that would stand out more clearly under the lights (which were far less effective than their modern counterparts). Liverpool were the first club to adopt red shorts to match their shirts, while Chelsea quickly followed suit with an all blue ensemble." Don Revie took over as Leeds United player manager in the spring of 1961 and went for a drastic colour change for the start of the 1961/62 season, introducing a plain all white throughout. United teams remained in the pristine strips until 1976, though many argued that the saintly purity of the kit was in stark contrast to the roughhouse onfield antics the manager employed. The only changes over Revie's time came with subtle modifications to badge, logo and collars. Bagchi and Rogerson: "Though (Revie's) decision effectively jettisoned forty years of United's history, astonishingly little was made of it at the time. The replacement colours were to be all white, in quite deliberate imitation of the famous all white of the finest team in the world, Real Madrid. To re-profile a club so efficiently on such a whim demonstrated the man's flair and vision, drawing a line under the failures of the past. That nobody remonstrated with him for it is an early sign of the Board's growing willingness to indulge him and of the interminable apathy of the majority of Leeds fans. Such a flagrant psychological gimmick was risky. If he pulled it off, it would be interpreted as a masterstroke. If 'New Leeds' continued to founder, however, it could look like hubris and finish his career. To invite comparisons with Gento, Di Stefano and Puskas when all he had was McConnell, Peyton and Cameron ... one has to admire Revie's nerve." The white had been tried temporarily some time before, as recorded by Andrew Mourant: "Early in 1960/61, spectators were given a glimpse of the future - for the home game against Middlesbrough on 17 September 1960, the team appeared in what was basically an all white strip, though with blue and gold trimmings, instead of the blue shirts, white shorts and blue and gold socks. "(Revie's) famous decision … showed the touch of a man with a dream, an ideal that his debt-ridden, down-at-heel club might one day emulate the feats of one of Europe's richest and most brilliantly successful teams. The move invited astonishment among some, ridicule from others. While Revie himself felt the club had not a cat in hell's chance of reaching such heights, he was determined to try anything to get players believing in themselves. And along with the new kit, Revie decreed that on away trips, players should no longer slum it in third-rate hotels but stay in the best establishments money could buy." Jack Charlton claimed that there was pragmatism behind the change: "This was the gear Real Madrid played in and the initial reaction from the local press was that Revie was aping the Spaniards. Not so, explained Don. In his opinion, white is the easiest colour to identify on a pitch. When you have only a split second to make a pass before the tackle comes in, you're more likely to pick up the right man if he's wearing not red or blue or green but white." Charlton borrowed the trick when he took over as Middlesbrough manager by adding a broad white hoop to the Teessiders' all red shirts. In 1964, Leeds United introduced a badge to the shirts: a perching owl on a white background circled by a dark blue border. The design was a surprise, given the superstitious Revie's morbid misgivings about the symbolism of birds. 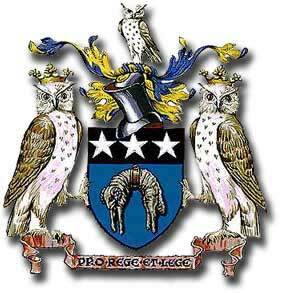 The owl came from the city crest, which itself was based on the crest of Sir John Saville, the first alderman of Leeds in 1931. Andrew Mourant: "His most famous superstition was his continued wearing of a 'lucky' blue suit, notwithstanding its shabbiness in later years. But Revie's waking hours were riddled with other phobias and rituals; taking the same route to his dug out before a match, a fear of ornamental elephants, a readiness to believe that a gypsy curse on Elland Road was preventing his side winning, even a distaste for birds on pictures or as motifs. "(Harry Reynolds' daughter) Margaret Veitch's husband Peter remembers a visit Revie made to their home in Pudsey shortly after they had done some decorating. 'We wanted to put some pictures up in the bedroom. The only ones I could get which were small were birds. He wouldn't go in the bedroom. He said: "What are they doing there... you don't have birds in your house. You don't have birds anywhere." That's the reason the owl was eventually taken off the club badge. He wouldn't have birds.'" Not too many other top teams wore white shirts in those days - Tottenham were the only regular example in the top flight until Derby County's promotion in 1969 - but competition in Europe meant that for United there was a growing necessity for an alternate strip when there was a clash of colours. For most of the decade, Leeds generally opted for blue shirts coupled with gold shorts and socks, but that made for a pretty unappetising combination. Phil Brown reporting for the Yorkshire Evening Post on the FA Cup clash with West Bromwich Albion in early 1967: "Graham Williams, Albion's left-back, led them out in all red, with a little boy mascot. United had also changed - blue shirts, yellow shorts (ugh!)" United gradually moved onto change kits of all blue or all red, but then settled on all yellow, as they famously wore in the 1972 FA Cup semi final against Birmingham City. By then, Revie's misgivings had led to the owl badge being ditched in favour of the scripted LUFC logo, as modelled for the first time in the 1971 Fairs Cup triumph over Juventus. Pedantics everywhere (one or two at least!) protested vehemently that there was a missing 'A' in the logo, because Leeds United's full title incorporated 'Association Football Club'. I guess it just wouldn't have looked as nice. 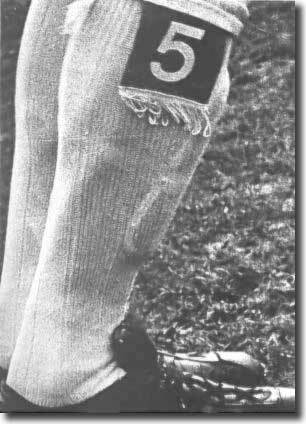 The 1971/72 campaign saw the introduction of numbered blue stocking tags; they embodied the snazzy Super Leeds image that evolved in 1972 after handsome televised victories over Manchester United and Southampton and the club's sole FA Cup win. The same kit and gimmicky tags were rather less lucky for United the following season when they lost an FA Cup final, a Cup Winners Cup final and finished third in the League. In 1973, as Revie's parting shot, came the embodiment of Seventies imagery with the iconic LU Smiley badge. It was a classic PR stunt from Revie, mingled with tracksuits bearing the players' names and branded footballs for hurling into the crowd after pre-kick off callisthenics. The manager's predilection for gimmicks was years ahead of its time and all with the explicit intention of gaining acceptance from a public outside of West Yorkshire. 1973/74 brought a record unbeaten run, a spectacular championship triumph and some wonderful performances. Revie was popularly credited for initiating the football industry's move to exploit the game's increasing commercial possibilities. He recognised that passionate football fans would be prepared to pay good money to wear replicas of the team strips worn by their heroes. The more distinctive the kit, the more obvious it was who was being supported. Revie arranged a deal with the new kids on the block, Admiral Sportswear, and for a while the United strip sported the distinctive Admiral logo, which enjoyed almost equal billing with the club badge. Revie repeated the trick when he took over the England team in 1974, though his time as a Football Association employee saw him branded as a money grabbing, disloyal mercenary. Dave Moor: "The established manufacturers, Umbro and Bukta, quickly followed suit and logos began to appear all over the place. Admiral pursued a vigorous and innovative marketing campaign, targeting the top clubs, radically redesigning their kits, which would then be showcased at important Cup finals. Rapidly a market was created. Instead of having to buy three or four sets of kit each season, leading clubs found that manufacturers were queuing up to offer free kits and a share of the profits from the sale of replicas. The new kits had, of course, to be distinctive to be saleable. When Manchester United adopted an Admiral kit in 1975, the popular press raised an outcry. Devoted fans now had to shell out £15 for an authentic United shirt instead of the £5 that would have bought a generic red shirt with white trim: in the pre-Thatcher era the Daily Mail for one considered this to be gross exploitation. "These commercial considerations drove a new wave of innovation in kit design. It became desirable for clubs to register copyright on their badges and to feature these on their shirts. Manufacturers competed to produce new designs that displayed their own logos to best effect. Admiral led the way and were quickly followed by Umbro and Bukta who all introduced kits that featured sleeve trim with their distinctive logos. "Towards the end of the 1970s there was increasing pressure on clubs to feature sponsors' logos on players' shirts, pressure that was resolutely resisted by the football and broadcasting authorities. Derby County landed the first deal with Saab in 1978 but the sponsored shirts were never worn after the pre-season photo shoot. It fell to Liverpool a year later to wear the first shirts to carry a sponsor's name in 1979. "Once Liverpool broke the mould, clubs began to exploit the potential revenue from selling shirt sponsorship. The BBC and ITV companies refused to broadcast matches featuring branded shirts, forcing clubs to remove sponsors' logos when the cameras were present. Coventry City thought they were on a winner when they introduced a kit that incorporated the logo of the Talbot car manufacturing company into the design but the TV companies blackballed them until they introduced an alternate strip for televised games. "In 1983 the TV companies finally gave way and allowed sponsored shirts to be broadcast: immediately the value of a sponsorship deal with a club that would feature regularly on Match of the Day or the equivalent ITV programme went through the roof. At the time, Football League regulations restricted the size of logos to a maximum of 81square centimetres (32 square inches) but for televised games they had to be half this size. "The monopoly enjoyed by Umbro and Bukta since time immemorial was now broken as a new breed of kit manufacturers stepped in with sophisticated new brands. Le Coq Sportif (France), Hummel (Denmark), Adidas (Germany), Patrick and Hobotts (UK) captured significant sections of the market that now included selling replica kits to fans. Admiral, who had done so much to transform kits in the previous decade, overextended themselves and were bought up by Adidas, although the brand re-emerged later in the decade. "In the 1982 FA Cup Final Tottenham Hotspur unveiled the first shadow stripe design and suddenly everyone was sporting shadow stripes, pinstripes or both as technology allowed for ever more intricate designs. "Towards the end of the decade, shirts became more generously cut as new lightweight fabrics became available. Improvements in production allowed for intricate designs to be woven or printed into the fabric itself, permitting manufacturers to counteract the burgeoning market in cheap counterfeit kits that began to appear." Leeds United were as effective as anyone in exploiting commercial possibilities. The period from 1976 through to 1981 saw the addition of busy blue and gold trims on collars, sleeves and cuffs, and a couple of variants on the Smiley badge. In 1981, the club switched kit manufacturers back to Umbro and introduced a new badge, similar to the last version of the Smiley but with a stylised peacock, after the club's original nickname, replacing the LU. It remained in place until 1984, when a new club badge was introduced. That lasted right through until 1998, making it the longest lived of the modern era. The Rose and Ball badge was distinctive, in the traditional blue, gold and white and incorporating the white rose of Yorkshire together with the club name. Relegation in the summer of 1982 brought financial hardship for Leeds United and a desperate scrabble for any funding that was available via sponsorship. The club's first sponsors, lasting just twelve months, were RFW (RF Winders), a company from Pudsey. Over the next three years United ran through three different patrons: Systime, WGK and Lion Cabinets. They then agreed a five-year deal, beginning in 1986, with local clothiers, the Burton Group. Future United chairman Peter Ridsdale was Managing Director of Burton's Top Man chain at the time and was the moving power behind the association, joining the United board in 1987. 1989-91 - Burton insisted that their Top Man brand be used for the remaining two years of their association and 1989/90 saw the logo introduced on a redesigned strip with a round, button up blue collar, with blue and gold trimmings added to shirt and socks. The new image brought luck as the period saw the club capture the Second Division title and fourth place in the top division. The away kit sported a rather busy pattern of yellow and amber triangles, with broad blue and white panels down the side of the shorts. 1991/92 - The same kits were in place for United's League championship year, though there was a change of sponsor. The Burton deal ended, and the club announced a multi-million pound deal with Admiral Sportswear; it was said that the arrangement would last for five years, but would not commence until 1992. The club had to find an alternative and managed to agree a stop gap association with the Yorkshire Evening Post to cover the twelve month period. The newspaper group certainly got its money's worth with the return of the championship to Elland Road after 18 years. 1992/93 - The new Admiral kit was only marginally different from the previous design, though it did incorporate a new V-neck look, but the change strip underwent a more radical transformation. The initial choice was a predominantly blue affair with an unsightly yellow-flecked pattern on the shoulder. 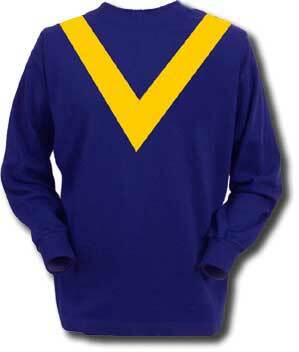 It was the first time that the club had moved away from yellow for an age, but a yellow variant with blue flecking was soon introduced because of potential colour clashes. It was the Admiral gear that bedecked the team as the club resumed its place in European competition and captured the Charity Shield. 1993-95 - Within twelve months of the commencement of the Admiral deal, there was a falling out and the two organisations parted company after a legal dispute. United established a new arrangement with the global Asics firm for the supply of its kit, while the Thistle Hotels chain became sponsors for three years. A completely new look was introduced with a blue and gold hoop across the chest and blue collar and cuffs. The change shirts were of blue and gold stripes, coupled with blue shorts and yellow socks; for a number of games the blue shorts and yellow socks were combined with the home shirts. The blue and gold stripes resulted in a number of colour clashes and, in early 1994, dark blue and green striped shirts were introduced. 1993 also saw the onset of squad numbering and players' names on shirts. The system was used for the first time in the League Cup final, on April 18 when Arsenal met Sheffield Wednesday. Less than a month later, squad numbers were used by the same two teams as they reconvened at Wembley to contest the 1993 FA Cup Final, and then again five days later for the replay. Squad numbers were introduced as standard for the 1993/94 Premiership season. 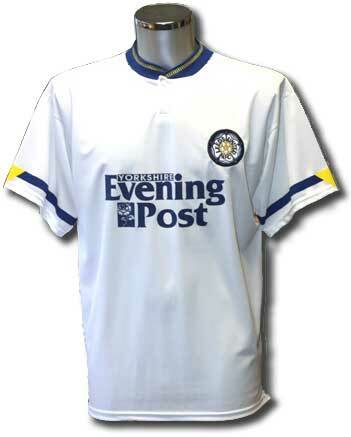 1995/96 - A distinctive all white kit was launched, featuring the return of the LUFC scripted logo, though still incorporating the Thistle Hotels brand. It represented a stylish recreation of the Seventies look and was the kit that Tony Yeboah wore during his marvellous early season run of goal getting - remember the beauties against Liverpool and Wimbledon? Unhappily the season petered out after a promising start - United made it to the League Cup final, although they couldn't compete with Aston Villa and were hammered 3-0. The green and blue stripes were dumped unceremoniously after an FA Cup tie at Bolton in 1996 with the players complaining that the colours were too dark and made it difficult to pick each other out. As a holding position, Asics introduced an all yellow alternative. 1996-98 - The summer of 1996 brought European Championship football to Elland Road and new backers in Puma and Packard Bell - London-based media group Caspian bought the club and introduced George Graham as manager. Together with the Packard Bell logo, the new kit incorporated a broad yellow trim. The change kit saw the white and yellow interchanged, while for 1997/98 the old gold and blue halved shirts of the Thirties and Forties were revived to spectacular effect. 1998-00 - In keeping with the global branding of the club, 1998 brought an end to the 14-year Rose and Ball period with the introduction of the shield badge, bringing a modern, almost European, feel. It was a radical change to what had gone before and it took a while to gain acceptance. After a year, there was a minor change, with a ball being added at the centre of the white rose. The home kit was virtually unchanged apart from the addition of a collar and the heavy usage of the Puma brand down the sleeves. 1999 brought a new change kit with the powder blue Lazio style shirt with dark blue trim and shorts. It was a stylish and popular design. A yellow version was introduced part the way through the season as a sop to traditionalists. 2000-02 - As United prepared for their UEFA Champions League debut in 2000, they joined forces with Nike and Bulmers. An almost completely white kit was introduced. The shirts restored the V-neck look and bore the Strongbow logo. Peter Ridsdale's European shield was seen throughout the continent as United made their way to the last four of the Champions League. The change kit for both seasons was a simple all yellow affair. A garish blue outfit with bold yellow trimmings was introduced in 2001 as a third option. 2002/03 - David O'Leary and Rio Ferdinand left Elland Road in the summer and Terry Venables was recruited to preside over a money-strapped decline. The only change in the home kit saw the introduction of a gimmicky white collar overlaying a blue V-neck. The brash blue change strip was retained for a second year, and United wore it when they won at Arsenal in their penultimate game to avoid relegation. An even more bizarre yellow and amber look was introduced as the third strip. 2003/04 - The whisky manufacturers Whyte and Mackay began a three-year association with United but had little to cheer about as Leeds slumped to disastrous relegation in 2004. The logo was the only change to the home kit, but a stylish dark blue outfit with yellow and white pinstripes was launched for some away games. It was one of the unluckiest kits ever used by the club - they gained a single point from the five games played in it, conceding 14 goals in the process. An all yellow kit was regularly used, and was best remembered in a ripped and torn state, as modelled by the ill-fated Roque Junior when he encountered Everton's Duncan Ferguson. 2004/05 - A new kit was introduced with blue and yellow flashes on sleeves, shorts and socks and sponsor's name added to the back of the shorts. An away strip of powder blue shirts and dark blue shorts, harking back to the European campaign of 1999/00, was introduced. 2005/06 - Yellow and blue pinstripes brought echoes of the Eighties when added to the white shirts. The change kit consisted of dark blue shirts, with sky blue trimmings and shorts. 2006/07 - In July 2006, Leeds United announced a major new deal with Bet24 on its website: "Leading internet betting site Bet24 will be featured on the front of the club's shirts next season, but the agreement goes far beyond a normal shirt sponsorship deal. Bet24 is 90 per cent owned by Modern Times Group and the agreement reached between United Chairman Ken Bates, Holger Kristiansen, the CEO of Bet24, and Jorgen Madsen, CEO of MTG Denmark, will go a long way towards regaining United's international standing, with all the commercial and merchandising opportunities that entails. "MTG is an international media group with operations in more than 30 countries around the world and is the principal broadcasting business in these regions. It is the largest free-to-air and pay-TV operator in the Nordic and Baltic regions and the largest commercial radio operator in northern Europe. MTG's Viasat TV channels reach 60 million people in 19 countries every day and MTG radio stations reach three million daily listeners. The company already has major connections with football and Viasat recently expanded their exclusive rights to show Champions League matches to the Baltic regions, Finland and Hungary to 2008-09. The home kit for 2006/07 saw the pinstripes disappear but heavy use of blue trim, alongside the Bet24 logo. The change strip saw the restoration of all yellow with blue collar and cuffs. The protracted struggle to exit administration in 2007 after relegation led to a delay in arrangements for a new sponsor. During the pre-season win at Darlington, United took to the field in shirts with tape covering the name of the lapsed sponsor. Eventually Red Kite Holdings, a property company was revealed as the new sponsors, with the red in their logo infuriating United fans. For 2007/08, the new Italian supplier, Macron, with whom Leeds signed a four-year contract, delivered traditional home and third kits but the new away outfit, in sky-blue and deep navy, was a complete novelty. Although the kits were formally announced on 10 July, the launch was spoiled by a dispute with their shirt sponsor, which delayed delivery. In August a sponsorship deal was finalised with Netflights.com. Netflights.com were a local online travel agent, who included Terry Fisher and former United captain Trevor Cherry in their management. The men came close to a buy out of United at the time the Gerald Krasner-led consortium rescued the club in 2004. According to the club's official website: "Netflights.com stepped in as a White Knight to rescue Leeds United after contractual difficulties with the proposed shirt sponsor proved unresolvable. "Netflights.com and Leeds United have successfully signed a three-year commercial agreement. The deal sees netflights.com becoming the official shirt sponsor of Leeds United. "The two organisations are working together to drive a variety of co-marketing opportunities during the season with netflights.com appearing throughout the club's Elland Road stadium, advertising on backdrops during interviews and advertising in the matchday programme. "The agreement was signed by netflights.com's Managing Director Terry Fisher and Ken Bates, chairman of United. "Fisher joined netflights.com just two years ago and has brought in a whole new management team and driven a return to profit for the business. Terry as well as being a keen Leeds supporter is also a knowledgeable football fan boasting the accolade of being the youngest ever football chairman, championing Huddersfield Town at the tender age of 29. "Terry isn't the only link to football within the netflights portfolio. Part of the travel group, Sellers Travel in Huddersfield is run by Trevor Cherry, ex United skipper who also captained England. Trevor is overjoyed at being involved with the club again. He is working closely with netflights.com and Leeds on this collaboration and will be a regular visitor to Elland Road throughout the season. "Leeds United's Head of Commercial Steve Lewis brokered the deal and is thrilled that Fisher has brought netflights.com in at the eleventh hour: 'We are delighted to welcome netflights.com as our new shirt sponsor - they have been a real white knight for us. We had signed a deal earlier in the year but contractual difficulties left us a without a sponsor just weeks before the season starts. Netflights.com is a company who are achieving great success and like Leeds has a rich history, something which we are both extremely proud of. We are really excited to be working together with a huge range of opportunities for two such popular crowd-pleasing brands. Everybody loves holidays and sport so with the combination of both we know our fans will be happy.'" For 2009/10, the netflights.com connection remained in place, and the new kit was used for the first time in the final League game of 2008/09, at home to Northampton on May 2. The new home kit was an attractive reinterpretation of their familiar all-white strip with a royal blue flash down the left hand side, trimmed with gold. Tradition was also maintained with the all-yellow away kit, which had royal blue side panels to the shirt and shorts, "an attractive interpretation" of the orthodox second choice. United chose to launch their 2010/11 kit in time for the final game of 2009/10, at home to Bristol Rovers, when they finally confirmed their promotion back to the Championship. It saw a return to the classic all white strip that had been synonymous with some of the greatest period in United's history. It could not have had a more fitting game in which to make its bow, showcasing a memorable day for United and their fans with Jermaine Beckford's only appearance in the kit being one of his best. Bucking the trend of the previous couple of years, when they had unveiled their new kit in the final game of the previous campaign, United held back on launching their 2011/12 kit until 7 July. The previous day, club Head of Media, Paul Dews, announced that the club would be releasing news of arrangements shortly, but then photos of the new home shirt, as modelled by club captain Jonny Howson, started circling on Twitter and the truth was accidentally confirmed by Lloyd Sam on his personal Twitter account. The following day, the club's website carried the official news at the same time as the identity of the new sponsors was revealed. Leedsunited.com reported as follows: "The kit for 2011/12 is a retro style shirt in white fabric and is influenced by the 1991/92 championship winning season which the club is celebrating this season. The shirt features include the shiny fabric and distinctive royal and yellow tipping on the sleeve. The home kit is launched on Saturday 16th July at 8am from the Elland Road and Online Superstores exclusively." Jonny Howson toed the party line: "The new kit is something the players always look forward to seeing. All of the lads were wanting a look as soon as it arrived and you feel like the new season's on the way now. It's a great shirt and the start of new things." The Scratching Shed fansite offered the less flattering comment: "Aside from the enormous cartoon sponsor on the shoulder and the enormous sponsor in the middle and the tacky white shiny material they've made it out of, I think you'll agree this is still one of the worst Leeds United kits ever. Fingers crossed it's a hoax!" Jagsnorbens tweeted: "Tell Jonny he needs to shave that bum fluff off. He looks like a 15-year-old trying to get into Yates'." Enterprise Insurance were identified as the new main sponsor. "Enterprise Insurance Company plc was established in 2004 and is based in Gibraltar, one of Europe's leading insurance centres. Enterprise provides a wide range of general insurance products - including motor, household, warranty and legal expenses on a wholesale basis - for client companies in the UK, France, and Greece. In the UK, Enterprise Insurance has over two million customers and provides products to a number of well-known blue chip companies. "Part of the new sponsorship deal will involve the launch of a new Leeds United branded portfolio of Insurance Services, in association with Motorway Direct plc, a business partner of Enterprise Insurance. Together the companies have in the region of 5 million insurance clients in the UK. "The agreement is for an initial one year term and will see all first team playing kit, training wear and replica kit branded with the Enterprise Insurance logo." Adult shirts were priced at £40 and Junior shirts at £36. The kit was used for first time in the first pre-season friendly, a 2-0 victory at Falkirk on 13 July, when the first goal came rather ingloriously courtesy of Falkirk defender Thomas Scobbie deflecting a cross from Ramon Nunez past his own keeper after 36 minutes. Rob Snodgrass was the first Leeds man to score in the new strip 18 minutes later with a header. 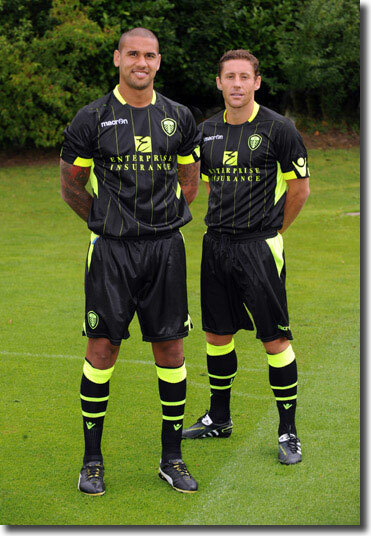 On 21 July, the club released the details of the new away kit for 2011/12, with Paddy Kisnorbo and new midfielder Michael Brown modelling the strip on the leedsunited.com website. The kit was basically all black with a green pin-stripe in the shirt and fluorescent lemon trim on the shirts, shorts and socks and the sponsor's logo blazoned across the chest in the same lemon. On the historicalkits.co.uk website the new second strip was described as "black with bright neon yellow trim - a break with tradition and perhaps one of the most unpleasant strips of the season", while thescratchingshed.com called it a glow-in-the-dark ensemble, adding, "The yellow and black colours Macron have gone with haven't caused too much of a shock as Lloyd Sam dropped that little bombshell a couple of weeks back. I'd personally assumed it would be predominantly yellow, however, so the black being the main colour did surprise me a little. I wish I could find the words to sum up the following, but I really can't…" However, a poll on the same site, showed fans split almost straight down the middle between liking it (49%) and disliking it (40%), with a further 11% undecided. The strip was worn for the first time in the friendly at Hillsborough against Sheffield Wednesday on Saturday, 23 July. United fought back from a goal down to draw 1-1 with Max Gradel the first scorer in the kit with a late penalty. The first official game played in the colours were in the Championship at West Ham on Sunday, 21 August, with the new kit launched the previous day at the Elland Road Superstore and Online Superstore, with fans encouraged to pre-order from 12 August from the website. The prices were the same as those for the home kit. The second change strip was the royal blue outfit launched in 2010/11, updated with the Enterprise Insurance logo. On 24 April 2012, United announced that Enterprise had extended their sponsorship agreement for a further two years and would continue to act as main sponsor until the end of the 2013/14 season. Chief Executive Shaun Harvey said: "We are delighted... We have developed an excellent working relationship with Enterprise Insurance during the course of this season and have launched a number of Leeds United branded insurance products through the partnership, including the increasingly popular Leeds United Insurance Compare website. We look forward to developing our relationship further with Enterprise and helping them to promote their business to a worldwide audience." Commenting on the extension of the sponsorship agreement, Enterprise Insurance Managing Director, Andrew Flowers, said "We are delighted to continue as the main sponsor for Leeds United. It's a terrific club and over the course of this season we have seen the real benefits of a marketing partnership with a globally recognised brand such as Leeds United. The Enterprise brand has been featured in 11 live games on television this season, generating significant exposure for our company not only in the UK but Internationally where we have growing business interests." "The shirt interprets the club colours in a unique style and has been designed by Macron, in conjunction with the club, in order to create a bespoke shirt that integrates a variety of different fabrics. The main body fabric is framed with a royal blue piping whilst the neck features a Korean style collar made of ribknit fabric with the year the club was founded, 1919, embroidered in the back neck along with the club's moto 'Pride of Yorkshire - Agmine in Uno'. Mesh inserts on the side flanks regulate the body temperature guaranteeing maximum breathability. "The new Macron 2012/13 home shirt is available in adult sizes small to 5XL, priced at £40 and junior sizes small junior to XL junior priced at £36. Adult home shorts are available in sizes small to 3XL and are priced at £19 with Junior home shorts available in sizes small junior to XL junior priced at £16. Adult home socks are available in sizes 7-11 and are priced at £10 and Junior home socks are available in sizes 12-2 and 3-6 priced at £8." The Scratching Shed fans' website had its doubts about some matters: "A major talking point following the unveiling has been the words Agmine in Uno which Macron have stitched into the back of the shirt... Obviously this was some kind of attempt at a Latin motto, much like Blackburn Rovers use with Arte et Labore which they claim translates to 'by skill and hard work'. Unlike Blackburn’s motto, which I’m assured is a solid translation, it seems Agnime In Uno falls into the category of faux-Latin. What Macron were trying to translate was 'Marching On Together'. I’m told that 'Agmine' is not a real word, but appears to have been taken from 'agminalis' - 'of or pertaining to a march'. 'In Uno' meanwhile translate into 'upon one' according to online translators – which it should be noted, are incredibly poor at translating Latin and are almost entirely to blame for the rise in poorly translated Latin mottos. "Speaking to a Latin student on twitter, he suggested the club use ‘incedamus cuncti’ (let’s march on altogether) explaining that 'mottos often use the subjunctive in Latin. Theirs is nonsensical.'" ''Agmine' is a 'real word', despite what you write. It is the ablative singular of 'agmen' which is a neuter noun that can mean 'a march'. When nouns are declined into the nominative case, it generally means that something is happening 'in, on, at, or within' the noun. What the club are trying to say with their crappy Bates-Latin is the phrase: 'in one march'. Therefore both the noun (march) and the adjective (one), must be declined in the ablative. Because 'agmen' is a neuter noun, the adjective must also take the neuter, so 'unus' becomes 'in uno'. The correct Latin syntax for this formulation should be 'in uno agmine', but whichever muppet translated it wanted to get the marching word at the front of the sentence, presumably because they had no knowledge of Latin. So there we 'agmine in uno' is a bastardised, faux Latin phrase that literally means 'in one march', but can be dubiously rendered as 'marching on together'. For those who want to take it a step further, the use of 'agmine' is perhaps ironic because the literal meaning of 'agmen' is 'that which is driven'. By that I mean it refers to something that marches because it is forced to march, rather than because it chooses to – like a herd of cattle, or an army, or a Nazi death march…"
Latin_Geek goes on to offer a better translation: "I think we should go for a present participle active… I reckon the best verb to use would be 'procedo'. It has a military sense, and means 'to go before, go forward, advance, proceed, march on, move forward, go forth'. So 'procedentes'. For a nice bit of alliteration, take 'pariter' as together, so 'Procedentes pariter' - marching on together." With the club still in the midst of secretive discussions about a potential transfer of ownership and with supporters besides themselves with impatience at the deafening silence, on 5 July, the official website revealed the away kit that would be used for the following two seasons. "The new kit, which has been designed by Macron in conjunction with the club combines technology with classic Italian style and presents the new 'azzurro' steel colour (blue). "The shirt was created integrating a range of different fabrics; the main body is complemented by navy blue flanks in a mesh fabric that define the profile of the shirt and allow maximum breathability. The neck comes in ribknit with under collar contrasting fabric and the year the club was founded, 1919, embroidered on the back. "The shirt will be on sale at the Elland Road Superstore from 9am on Thursday 2 August. "The new Macron 2012/14 away shirt is available in adult sizes Small to 5XL, priced at £40 and junior sizes Small Junior to XL Junior, priced at £36. Adult away shorts are available in sizes Small to 3XL and are prices at £19 with junior away shorts available in sizes Small Junior to XL Junior, priced at £16. Adult away socks are available in sizes 7-11 and are priced at £10 and junior away socks are available in sizes 12-2 and 3-6, priced at £8. Infant and baby away kits are also available priced at £32 for infants and £28 for babies." "Positives - I quite like the sky blue, or Azura blue as Macron are calling it. It's certainly an improvement on the horrific glow-in-the-dark number we played in last season, and I always prefer some shade of blue to bright yellow. The latter attracts far too many insects for my liking. It doesn't glow-in-the-dark. I know I covered this above, but I can't overstate how important that is. It's a normal collar, one that doesn't make it look like circulation to your brain is being cut off by your shirt (like the home kit). Whoever we sign to replace Adam Clayton can also do the Eric Cantona thing with it. He can, but he probably won't. "Negatives - The shorts. I don't really care too much about the shorts as I never buy them anyway. If such a day comes when Leeds United are having an extreme injury crisis and they need to call upon the Kop for reinforcements, they can take me in jeans and replica shirt or not at all. I'm sure they have a pair of shorts I can use in the changing rooms, but there's absolutely no way I'll be wearing a pair that looks like they took inspiration from the mudguards on old American muscle cars. - Stupid cartoon men. I rattle on about this every time Leeds United unveil a new shirt, but come on, do Macron really think people will someday take them seriously with that ridiculous matchstick man plastered all over their products? It has to be the most ridiculous sporting logo I've ever seen. Well, except Kappa. And Le Coq Sportif. But definitely top three. "Overall Let's be honest, the monstrosity they released last season makes this incredibly easy to like. Short of releasing an all red kit, it really wasn't possible to create anything worse. It's sort of like playing Paul Rachubka in goal - the bloke from your local pub team could follow, he's going to look good by comparison. That said, I'd give this effort a solid 3/5. Get rid of the silly cartoon men, finish stitching the sides up and destroy the shorts, and Macron could quite easily have earned themselves a 4/5. And that's better than it sounds, as there isn't a single Leeds shirt since the 1970's that I'd give a 5/5 to." Out of a poll of 1,000 visitors to the site, 19% gave it 5 stars, 48% 4, 22% 3, 7% 2 and 4% 1. The Yorkshire Evening Post's poll saw 65% saying they liked the kit. On 24 April 2013, just four days after United's stay in the Championship for another season was confirmed with promotion and relegation both mathematically impossible, came the now customary pre-end-of-season announcement of the home kit for the forthcoming season. The club's official site announced: "We are proud to reveal the new Leeds United Macron home kit that the team will be wearing for the 2013/14 campaign. The white shirt features retro vertical stripes in blue and yellow which adds a different dimension to the famous white shirt. The collar is ribbed in royal blue and the shirt has micro mesh side panels for better movement. The back neck also features an appliquéd Leeds United rose. "The shirt is teamed with white shorts and socks which feature details taken from the retro stripe on the shirt. The bespoke kit has been designed by the club and Macron to create a kit unique to Leeds United integrating various different fabrics. "As per the current season, the Home Shirt is available in a bodyfit style, as worn by Leeds United first team. The bodyfit shirt allows freedom of movement and the jersey weave incorporates elastane which guarantees regular compression and facilitates movements by adhering to the body. "The shirt features the logos of Main Club Sponsor, Enterprise Insurance, and brand new Secondary Shirt Sponsor, Help-Link UK." The deal with Help-Link, one the UK's largest home heating providers, had been announced the previous day, with their logo appearing on the back of the shirt, just below the player's number. United Chief Executive Shaun Harvey said: "We are delighted to welcome Help-Link into our growing commercial partners programme as secondary shirt sponsor. Help-Link is a market leading brand and one of the fastest growing businesses in the UK and we are proud to have their brand on our shirts. "We look forward to working with the Help-Link team throughout the course of the agreement to deliver high profile, national brand visibility and return on investment. We are confident that Leeds United fans throughout the UK will be able to take advantage of the wide range of heating services that Help-Link has to offer and be able to heat their homes for less." Commenting, Alan Dickinson, Director of Help-Link UK said: "As Help-Link is a Leeds based company, we feel it is an exciting opportunity to support and work alongside the club. We are proud to be affiliated with the sport, Leeds United and what it represents to nationwide communities. Therefore through our involvement and association we are looking forward to our brand further carrying this notion." The new kit went on sale on Saturday 27 April at the Elland Road Superstore and online, with the team wearing it for the first time that same day in the final home game against Brighton and Hove Albion. Adult shirts were priced at £43 for short sleeves and £46 for the long sleeved variety, with shorts costing £19 and socks £10. The initial reaction from supporters was not positive, with many complaining that blue stripes only belonged on the shirts of local rivals Huddersfield Town and Sheffield Wednesday. The Spoughts website noted: "The shirt has received a very negative response from Leeds fans on twitter… goes against what fans have been demanding for months, which is a standard all-white kit. 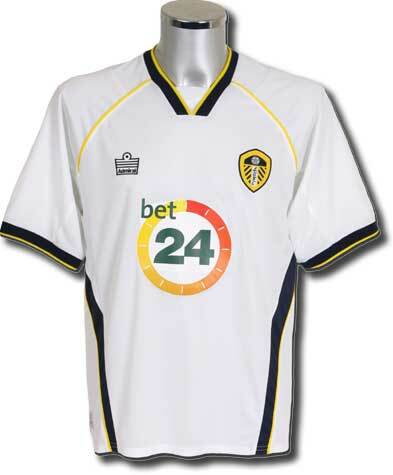 It can be said that it is very easy to design a good Leeds shirt, but also very easy to ruin one completely. In the future, it would be worth noting that little is needed in the way of incremental improvement. Leeds fans will likely purchase an all-white shirt over and over, as long as it is nice. It feels ludicrous saying it, but even a return to the 2010/11 home kit would be a vast improvement." Under the headline, 'Why today's kit is such a disappointment', another page on the Spoughts site went even further. "Leeds is a city with historic ties to the industry of tailoring, with the Montague Burton factory in Leeds considered a city unto itself during its peak of the 1930s. The city's sizeable Jewish population also had a hand in the tailoring industry, with the industry essentially sustaining the community at certain junctures, with 63% of the male working members of the community employed as tailors in 1901. For a city with such a great past for quality clothing, one of the representatives of the city, Leeds United, should be enrobed in a glorious manner. What has been revealed today is anything but that. "This coming season is the 54th anniversary of the first time we wore an all-white kit, the transition having been made at the hands of Don Revie. Since then, there's been some spectacular interpretations of a kit and colour that should ooze class, the footballing equivalent of a classy white collared shirt. "In the last few years Macron, an Italian sportswear manufacturer, have taken over the license for Leeds kits, and systematically ruined every design. 2010/11 is the only high point, where a team playing beautiful attacking football had a kit to match. "Today's announcement is an abomination to the notion of the all-white kit. It would be fine as an AC Milan away kit in 1995, because that's what it looks like. This is not Leeds United at all. As I said before, it is incredibly easy to design a good Leeds kit - it has to be white, and wearable. It is similarly incredibly easy to ruin one with superfluous additions. It should be basic and simple, and that is always enough. "Today's kit is the equivalent of racing stripes on a white Mustang. It's unnecessary, tacky and makes it look like crap. It also speaks for how out of touch whoever makes these decisions is at Leeds with the fanbase at large - how many people will have emailed repeatedly GFH Capital's email address for suggestions about Leeds, and how massively must these have been ignored to get today's result. "The response has been incredibly negative, and will likely lead to poorer sales than anticipated. With the club probably requiring funds for a promotion push, this is probably not the reception that was wanted. The sad thing is that clearly the fans could do a better job of telling Macron what is actually wanted than whoever selected this design at Elland Road - in 12 months, we'll have to go again and hope they get it right next time." The WeAllLoveLeeds site commented succinctly, Aaaaaaarrrgghhhhhh! !, and described the kit as 'tawdry'. TheScratchingShed.com was a little more objective, saying: "Another season, another Leeds United kit launch, another mixed reaction from fans. "Following two days of Leeds United posting teaser shots to Twitter - none of which gave much away - today finally saw the new kit unveiled. "An enormous blue and yellow racing stripe down the centre wouldn't have been a design recommendation I'd have lobbied for, but for reasons I can't explain, I actually quite like Macron's latest effort. "'Leeds United's home kit should be entirely white', argue many fans, and I do agree our best kits (like the '72 Cup final shirt) have been entirely white. But if people want to make this a purist argument based on club colours and history, Leeds United's home kit should really be blue and yellow, as per the city's crest and the club badge. Don Revie introduced the white to copy Real Madrid in a move not dissimilar to the one Cardiff City's owners pulled last season. "We're probably more associated with white than blue and yellow these days, but the trouble with an entirely white kit is there's absolutely nothing you can do from a design perspective. The only thing that would ever change is the sponsors, no one is going to pay £43 to keep up with the new sponsors each season. "And it's not as if the entire fanbase despise the new kit. Seems to me that the latest kit is no different to the reception every kit gets - some like it, some don't. I doubt there's ever been a Leeds United kit which pleased everyone. "If nothing else, the go-faster stripes should at least improve Michael Brown's speed." By 27 April, the poll on the same site had received around 1500 responses, with 35% declaring they loved the new kit, 36% hating it and 29% undecided. That same day, United wore the kit for the first time, against Brighton in their final home match of 2012/13, a game they lost 2-1 with Rodolph Austin and El Hadji Diouf both dismissed. On 22 July, just a couple of weeks away from the opening day of the 2013/14 season, the club revealed their new away kit, the club's official website going for dramatic effect under the headline, "Time To Shine," and continuing with: "The wait is over and our golden treasure has been found." The club had used Twitter over the preceding few days to trail the #LUFCTreasureHunt, with referring to the fact that the new shirt was largely of a distinctive gold in colour with "navy detailing teamed with navy shorts. The collar of the shirt is a gold and navy rib which is reflected in the socks, completing the kit which will be worn by the team on their travels over the forthcoming season. The shirt and shorts feature a tonal navy and gold crest which can also be seen on the new range of training wear which has already received a great response from supporters… The shirt features the logos of Main Club Sponsor, Enterprise Insurance, and brand new Secondary Shirt Sponsor, Help Link UK." The change kit was worn for the first time in the pre-season friendly against FC Nurnberg at Elland Road on 27 July. The German Bundesliga outfit showed the gulf in class by emerging with an impressive 2-0 victory. Its first usage in a competitive fixture was on 11 August in the 0-0 draw away to Leicester City in the Championship. On 5 September, Enterprise Insurance extended their agreement to act as United's main sponsors, rolling on the original three-year deal for a further three seasons, through to the end of the 2016/17 campaign, makingt it the longest deal of its kind in United's history. United Managing Director David Haigh said: "The club is delighted to secure further long-term investment and support from our main sponsor. We're particularly delighted to see such a long-standing partner re-invest in the future and show such support and confidence in the management of the club. "We continue to grow and develop our Commercial Partners programme and it's important that our Partners are able to join us on our journey. The new deal will represent the longest running main club sponsorship in the club's history and it is testament to how the club delivers real value to its sponsors and actively manages the commercial partnerships that we have established." Enterprise Managing Director Andrew Flowers was delighted to pledge his support for a further three years, saying: "We are delighted to be able to extend our association with the club. The brand awareness that the shirt sponsorship has generated has enabled the company to open new markets and secure new business. As part of our further International expansion plans we see the shirt sponsorship opportunity as a key vehicle for driving visibility of our brand around the World. As a lifelong supporter of the club I am also delighted to be able to support the club for an extended period as we seek to return to the top flight of English football where the club belongs." "For the new season the club returns to its famous all white strip. To enhance the purity of the design, we have worked in collaboration with our Technical Kit Provider Macron to create bespoke white Macron logos. This kit feature is exclusive to Leeds United. 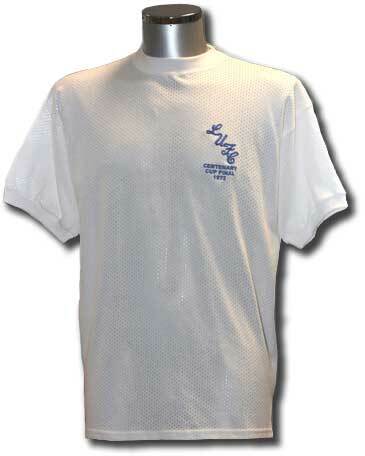 "The new shirt is teamed with all white shorts and white socks. Worn together the new kit will create an imposing presence for any team visiting Elland Road. Additional details include the LUFC script embossed down both sides of the shirt and the back of the collar also features a printed LUFC script. "Main Club Sponsor Enterprise Insurance and Secondary Shirt Sponsor Help-Link both feature on the new kit with both partners having updated brand logos." The goalkeeper's shirt featured a distinctive green and black camouflage design. Andrew Flowers, Managing Director at Enterprise Insurance, commented: "We are extremely proud to have the Enterprise Insurance logo on the famous white Leeds United shirt. As a lifelong supporter I am delighted to see the return of the classic all white playing strip and hope that this season is the start of a successful new era in the history of the club." Alan Dickinson, Sales and Marketing Director at Help-Link Home, said: "We are delighted to be supporting Leeds once again. This is a new season and new beginning for the club, likewise we at Help-Link are entering a new era with the launch of our full service Help-Link Home brand; so it is extremely fitting that we move forward together." The new home kit went on sale from 10am on Saturday 28 June and was available from the Elland Road Superstore and the Online Superstore, with a special launch event at the club store. The standard fit short sleeved shirt retailed at £43 with the long sleeved version costing £3 more. The bodyfit shirt was £47. On 11 August, the new away kit was released, a stylish looking navy blue kit with fine horizontal white stripes. The shirt was polo style and incorporated a sewn ribbed collar with three buttons and a tonal white and navy crest. Shorts and socks were in the same navy with horizontal white stripes and the kit carried the main Enterprise Insurance-sponsored logo with the secondary Help-Link logo also featured. The kit was worn for the first time away to Watford on 16 August. The news had already been accidentally leaked by the Football League which had featured a picture of the new strip on their official website at the end of July.